I'm into pinterest these days for a lot of reasons and finding new ideas for outfits is one of them! 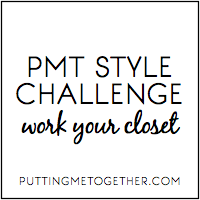 This week's style challenge from Putting Me Together is to wear something you have pinned. Lately I've been really into the idea of winter whites or wearing lighter neutrals for winter. One of my favorites is this pin from Christine of Hello Fashion, its one of those I try to pin several times and I get that (whoops you already pinned this) message each time. Ok, so once upon a time there was this show called Trading Spaces and it was just the best. On one particular episode one of the designers decided to design a room around the color white. So everything in the whole room was replaced with bright white - white walls, white floors, white furniture. He called the room "white whoa". Needless to say the homeowners were speechless and quite unhappy. Why this episode is still fresh in my mind I do not know but this is the point > At first go, I went all white with my outfit (white top and white jeans) and immediately it was feeling a little too #whitewhoa for me. Instead of completely giving up I decided to change it up a bit and do more of a neutral toned outfit. Still keeping with the same idea but a little more softer. In the end, I was much happier with it. There really are numerous ways to even put neutral together. Its always fun to come up with new ways to wear the pieces in your closet. Try something new this week! 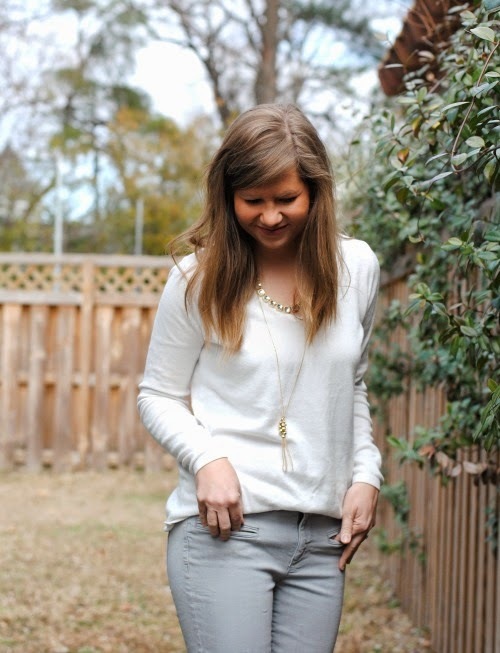 Beautiful look and it really works well with the softer neutrals, especially with those booties. I remember Trading Spaces. I don't remember that particular episode, but remember the unhappy homeowners. Thanks Megan! Ankle boots are my new favorite thing. There were so many crazy episodes!! Loving the grey/gray jeans. Been looking for a pair myself. Thanks Tiffany! These are from Loft :)...I never know which way to spell gray either!